It’s normal for toddlers to get anxious when being separated from their mother or father. It’s a normal response that happens, since the children are so small, they cannot understand that the separation might not be a long therm one. For the toddler, it’s about the abandon, a threat to his or her safety and fear. So when they are small, all children need socializing, so they can grow up harmoniously. This is why their innate need to stay attached or to spend time in the company or their parents or relatives, is most important. When a nanny or a caregiver comes into the life of a child, it’s a change that needs to happen gradually. The toddler will soon understand that there is someone there to take care of all the needs, may it be regarding to play, food or simply communication. You play the most important role in your child’s life. You are their parent, and that will never change, even when he becomes adult. So know from now, that even if the child accepts the caregiver or the nanny, it’s not because they can go without you being there. But because you made it possible, so they feel safe, with someone you decided to be there, for them. Even if they develop a friendly relationship or a bond, which is for the best, you are still the most important person in their life. You have to be a brige between your child and the caregiver. Make the experience for your toddler a natural one, and introduce the caregiver gradually into their life. 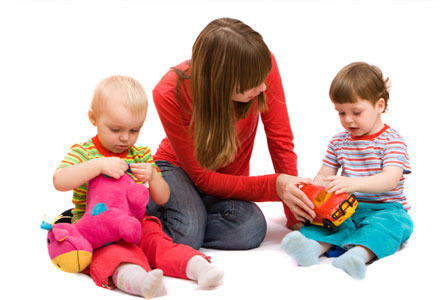 Let them spend more and more time together, making the toddler get used to a new presence that they will learn to like and appreciate. After they get to the point where the play is involved, communication and enthusiasm, you can sit nearby and enjoy their interactions. Don’t engage, just be present. Gradually the toddler will know that a few hours will be spent in the company of a caregiver, and then they can get your full attention and love. This is essential for the child, so that they can remember a certain pattern. You hug them, tell them sweet reassuring words or spend time with both the toddler and the caregiver, make sure you stick to a routine. Don’t try to sneak out, because it makes the anxiety worse. Be there for your child, even if they start crying. Reassure them that nothing bad will happen and that you will be back. Try to put all these into rehearsing, so that the toddler can gradually know that it’s time for you to leave. Also, try not to be late picking your toddler up or be in time at home. Knowing that your promises are kept is what makes the child feel safe. Despite that fact that a toddler is a small child, don’t think that they do not understand what is happening around them at all. You need to explain the changes that take place in their life and gradually introduce this change. Communications should exist between you and the caregiver. Plan activities together, because you know your child better than anyone else. Credentials and recommendations are important when we consider bringing a caregiver into our child’s life. But so is empathy, emotional understanding and social interaction. Try to find someone that inspires you all of these qualities and try to find out more about the person. Understand their background, be open to their carrier choices, being a caregiver might be something that they do part-time or for the moment, so try to make their experience a positive one, that your toddler can also remember in a positive way.